A piece of land covering the peak of Pearl Hill in Tanjung Bungah and its surrounding area in Penang will be transformed into a park with a viewing point for tourists. 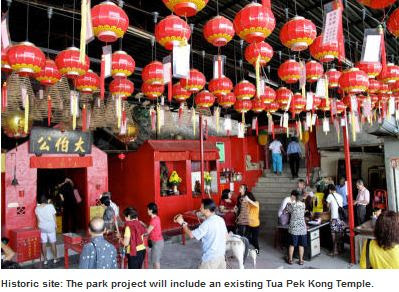 Tanjung Bungah assemblyman Teh Yee Cheu said a 6.07ha piece of land where a Tua Pek Kong Temple is located near the peak of the hill had been identified for the project. He said the park would be located some 152.4m above sea level. It would provide tourists with a panoramic view of the sea, Tanjung Bungah, Tanjung Tokong and Batu Ferringhi, he said. He also said a working committee comprising temple committee members, residents, Tanjung Bungah Resident Association members, Tanjung Bungah Community Development and Security Committee (JKKK), Taman Seri Setia JKKK, would be formed in two weeks’ time. “The committee will look into cleaning and beautifying the surrounding area. “We hope to allocate a small plot for a Chinese medicine practitioner to plant some herbs,” he said, adding that the Penang Municipal Council would also be working together with the committee on the project. Teh said development in the area would be kept minimal. “We do not know how much will be needed for the project until the committee is formed. “The state has agreed in principle to the project and I hope the paperwork will be completed soon to get the project started,” he said after holding a discussion session on the project with residents and members of the concerned groups yesterday. Teh said the private sector was also welcome to sponsor some tables and chairs for the project. Can you please try to form a multi-racial committee so that things can be looked at from all angles.